Official Daisy Red Ryder Range Model 1938 Air Rifle BB Gun? 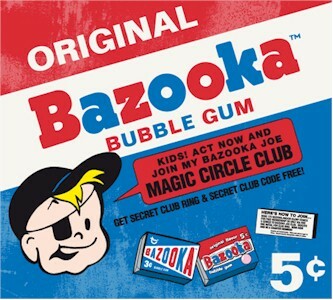 Bazooka Joe was the kid with the baseball cap and eye patch. Mort was the one with the turtle neck. The boy with his turtle neck pulled up over his face was "Mort". That pink gum had a sweet fragrance unlike any other. Baseball card flat gum smelled great, too. I loved the comics AND the gum. Also, I seem to recall a Bazooka boy character that wore his polo shirt pulled up over half his face. I got one of the premiums that they advertised on the comics, which were free, plus shipping and handling if you had enough comics to submit, and $.50 if you didn't, along with 5 comics. I got the little sub that shot torpedos at little ship that flew into about 4 pieces when you hit it right. Yup.....a penny a piece in the 1960's. Our barber gave them to the kids after we got our .75 cent haircut (plus .25 cent tip). He would always slick up our hair with Wildroot....some type of "hair tonic". (?). At home we used Brylcreem.....blue gel if I remember......"A lil dab will do ya". LOL !!! Five cents was for a pack,I think it had six pieces. I remember it costing a penny a piece in the early 1960's, not sure when it cost a NICKLE?? ?